Here’s the deal. The media thinks your CEO screwed up. According to rumors, she siphoned the company’s quarterly earnings into a private yacht spending spree. The truth? Your CEO is innocent. But what does the media care about truth? They’re hanging onto the rumors like a toddler clutching a Snickers bar. The Internet’s news minions are intent on vilifying a corporate leader, weaving tales of oversized yachts funded with ill-gotten gain. Rumor blogs, news articles, gossip columns, and social media are fomenting with questions, allegations, and accusations. You, as the CMO, are tasked with damage control. Online reputation management (ORM) is the answer. But what exactly should you do? The situation described above has happened dozens of times before, is happening right now, and will happen to a CEO near you. Reputations are either built or burned by a well-placed tweet, a viral news story, or a sinister plot. As you go into reputation-salvage mode, there are three things you need to be aware of. 1. Destroying a CEO’s reputation is shockingly commonplace. Oscar Munoz, CEO of United Airlines, experienced severe reputation repercussions in the wake of security personnel mishandling a passenger. 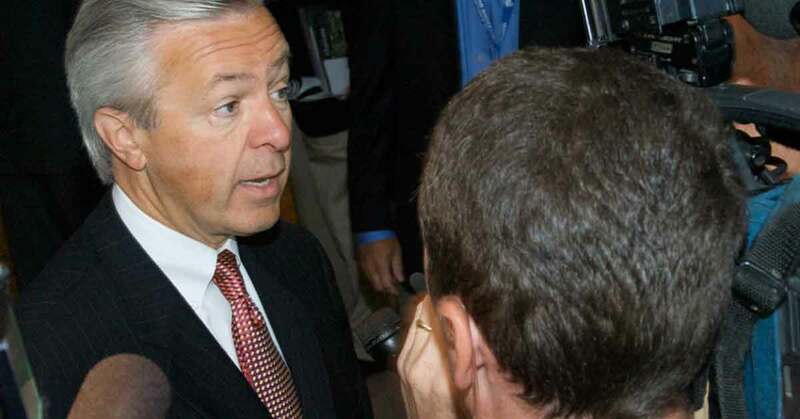 CEO John Stumpf was out of a job after employees opened fraudulent Wells Fargo accounts to boost numbers. Hiroya Kawasaki, CEO of Kobe Steel abdicated his role after the company’s half-century of cover-ups and misdeeds regarding data fraud, compliance sidestepping, and corporate cheating. Whether guilty, innocent, or somewhere in between, these business personalities all suffered a crushing blow to their reputation. But there are more than just the headline-makers. According to investigative reporting from the Washington Post, 31% of CEO successions between 2007 and 2011 were due to scandals of some variety. Put another way, CEOs have a 30% chance of being jettisoned over some imbroglio. Put yet another way, CEOs walk around with a target on their back. For most contemporary businesses, “crisis management” and “reputation management” are synonymous. There is a reason CEO reputation management matters. 2. Negative information has a corollary negative impact on revenue. According to the Cone Online Influence Trend Tracker, consumer spending on a brand nosedives when those consumers hear negative information about that brand or the brand’s leadership. Eighty percent of survey respondents affirmed that they changed their mind about a purchase after hearing negative information. Those aren’t detached statistics. Those numbers impact real sales. But what kind of negative information causes this kind of detrimental effect? It doesn’t matter. 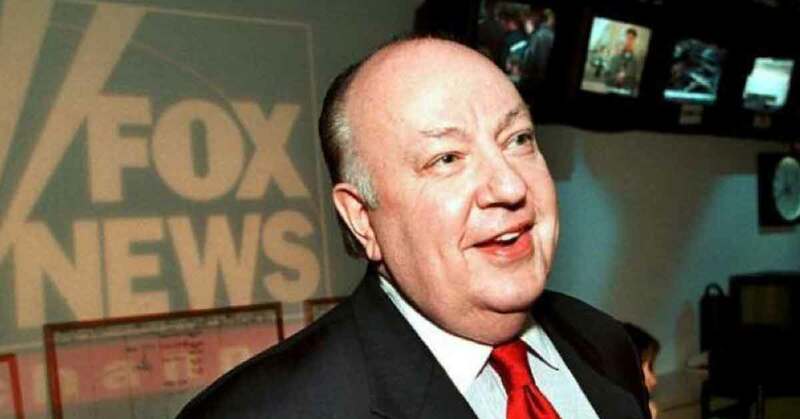 Anything from a sour Amazon review to a salacious rumor qualifies as negative information. The more outsized the story, of course, the more negative it is and the farther reaching its impact. 3. Reputations are really fragile things. Any negative event can destroy a company or CEO’s reputation. A company’s reputation is also vulnerable if the media are focused on just a few topics, such as earnings and the personality of the CEO. 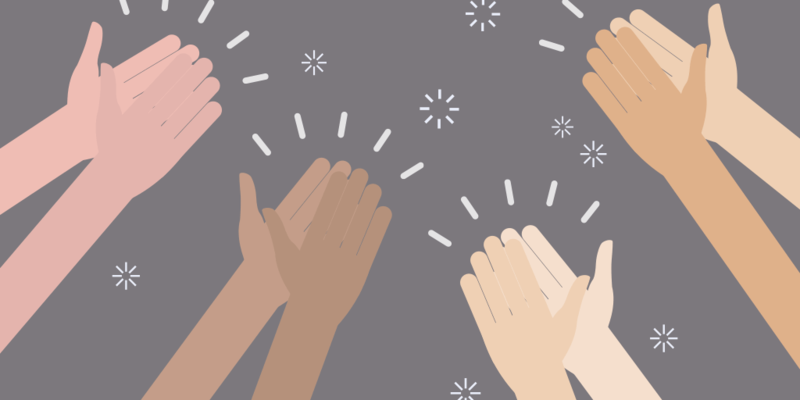 Even if the coverage of these topics is extremely favorable, a negative event outside these areas will have a much larger negative impact than it would have if the firm had enjoyed broader positive coverage. If the CEO’s personality is off, the reputation of the entire company is in jeopardy. The CEO is the company’s reputation. Need proof? According to the Weber Shandwick and KRC Research report, a jaw-dropping 45% of a company’s reputation is tied to the reputation of the CEO. The CEO is Goliath. If she falls, so does the entire army. We’re not talking about saving one man or woman’s reputation. We’re talking about saving an entire corporate empire — employees, the employees’ families, stakeholders, customers, fans, followers, corporate partners, suppliers, and service providers — from precipitous decline. There is a lot at stake. And saving the company as a whole requires protecting the reputation of the leader at the helm of that company. The stage is set. These three truths provide the context for your task of remediating a CEO’s online presence. Now, it’s time to do the actual work of reputation management. Repairing executive reputation: Four steps to rebuilding online character. Stay above the awareness threshold. The “awareness threshold” refers to a minimum quantity of the company’s mentions or stories by well-known media outlets. The public must possess an awareness of your company or CEO in order for your company or CEO to possess a reputation. Employees or representatives of the company must maintain above a 35% share of voice (SOV) in news stories. It is assumed here that the employees will remark positively on the company, whereas the remaining 65% of SOV may be a mix of neutral, positive, and negative. Yes, there a strategic formula for reputation management. But what do you actually do? The big idea is ownership. You, as the saver of the CEO’s bacon, should strive to own the flow of information, thereby controlling the ratios explained above. Admittedly, you are at the mercy of Google’s algorithms — RankBrain and Google News algorithm, specifically. But there are tactics that allow you to adapt to the algorithm, thereby influencing what content appears where. These four steps are designed to achieve or above the ratios required to influence a CEO’s reputation and the reputation of a business. 1. Remove any potentially incriminating content if possible. “Owned content” is anything on your business’s website, social media accounts or other web properties. It may also include anything on the CEO’s personal website or social media accounts. Since you own these channels, you can scrub them of any content that may not be enhancing the CEO’s reputation. Although your CEO (and the brand) has no control over some of what is said about them, there are plenty of owned properties and social accounts where it’s easy to exercise direct editing — owned, paid, and social. 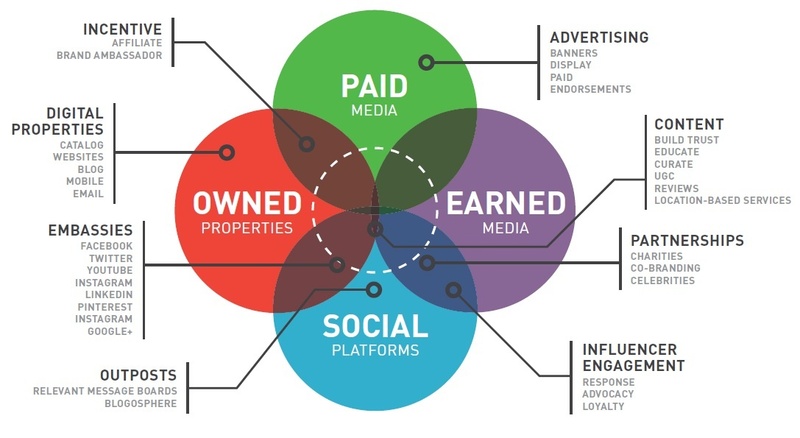 Even “earned” media can be influenced to a degree. Identify the source of the negative information. If any of the negative information is owned, remove it as quickly as possible. If you do not own the content, consider diplomatically requesting the removal of the content if it is owned by a known ally. Take this approach with extreme caution. Learn from and avoid the mistakes of high-profile reputation-fixing efforts. There is a high likelihood that information is already widespread. Screenshots, Reddit threads, blog articles, online reviews, press releases, and 4chan discussions may already be in play, in which case, you’ll need to double down on the following tactics. 2. Publish fresh evergreen content. Removing content is only one method of shaping business reputation and a limited one at that. A far more effective method is to publish content that quantitatively overpowers the negative content. Evergreen content creation, an SEO tactic, is remarkably effective. Again, the idea here is ownership. You, as a business, possess the ability to publish accurate information. As you publish this information online, it effectively counteracts the negativity that is eroding your CEO’s reputation. How does this work? 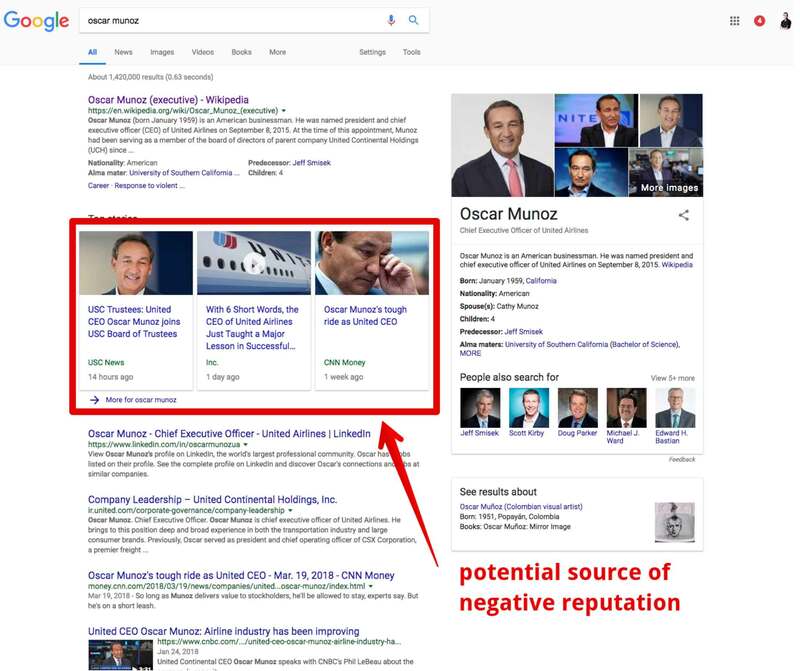 When someone googles your CEO’s name during a period of reputational crisis, the search engine results page (SERP) probably shows some form of negative information. Often, these results are in the news carousel. Just as often, the negative results are from the organic results. 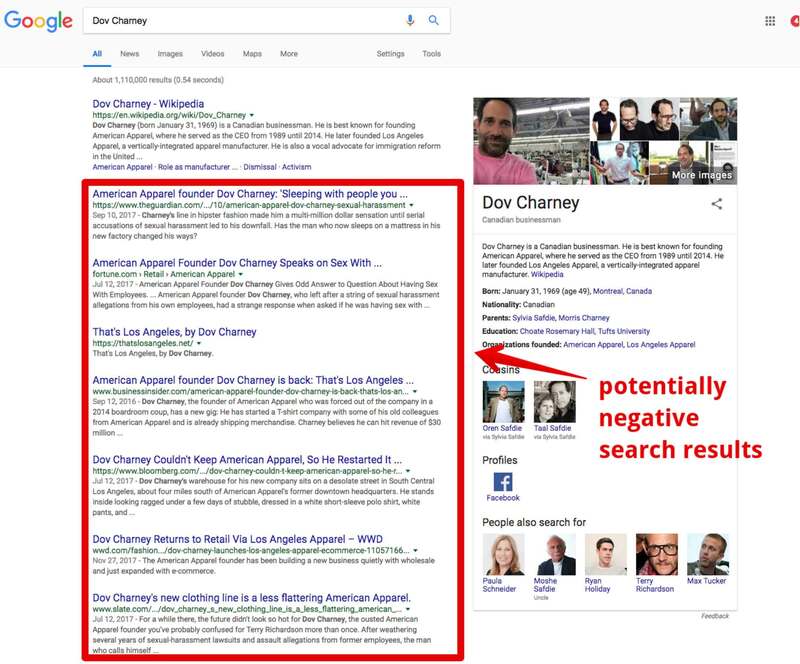 The featured results on Google’s first page are often the source of a compromised reputation. Removing these results is challenging if not altogether impossible. But pushing them down is often achievable. 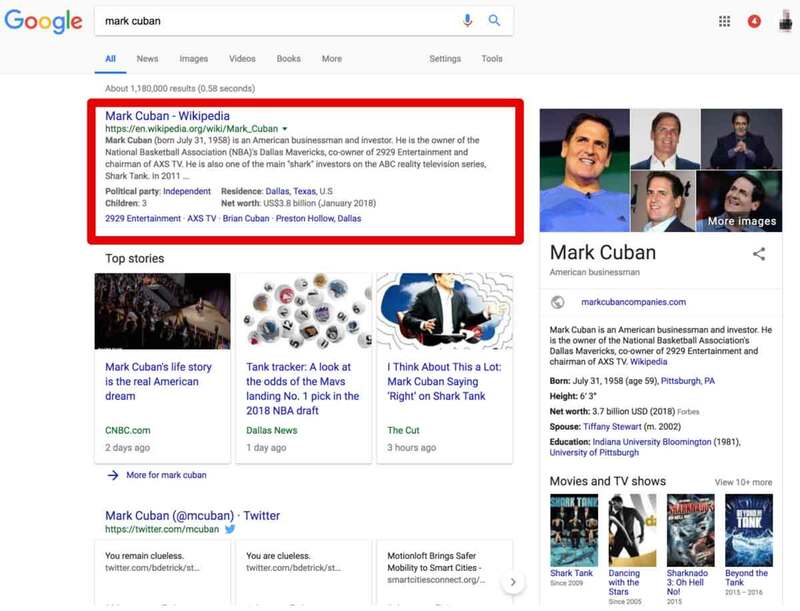 Most people do not search past the first page of Google search results, so if you can create content that ranks high on Google’s first page, you effectively bury the other results. If she doesn’t have one already, create a website for the CEO using her name as the URL (e.g., www.JaneSmith.com). Write biographical information about the individual. If possible, include videos (hosted on YouTube) featuring the CEO. Link to the CEO’s personal social media accounts. Create a page on the company website that also features the CEO. The URL of the page should follow this convention: www.example.com/JaneSmith, where “JaneSmith” is the CEO’s name. Again, add images, videos, and links to the CEO’s social media accounts. Find guest blogging opportunities where the CEO can write and publish content. In contrast to news articles, which may or may not appear at the top of the search results, evergreen content has a strong chance at always ranking high. In addition, according to research from CognitiveSEO.com, evergreen pages continue to increase the amount of organic traffic they attract over time. A great example of evergreen content is Wikipedia biography pages. They are evergreen and often outrank trending news topics. Burying negative news during the surge in “Matt Lauer” searches would have been difficult due to the vast public interest and the outpouring of negative mentions. As the trending topic died down, however, the algorithm would likely value personally-branded evergreen pages once again. Bill O’Reilly did this with his personal site, www.billoreilly.com. Through an aggressive publication of up-to-the-minute news commentary and social media activity, he managed to shove much the negativity below the fold — onto page 2 of Google and beyond. The process does take time. However, no matter how badly your CEO’s reputation is being trampled, it’s possible to restore it by publishing fresh, evergreen content. 3. Create a Google News publisher site and publish content. Creating a news section on your company website provides a way for you to rapidly push positive content higher in the search results, particularly in Google News where it makes the biggest difference in trending perceptions. How do you create a news site or section on your website? First, create a fresh website (an entirely new URL) or repurpose a new section of your own website (e.g., www.yourcompany.com/news) for publishing up-to-date and newsworthy content. Make sure that your site meets the general News index guidelines according to Google. Make sure that your site meets the technical News index guidelines according to Google. 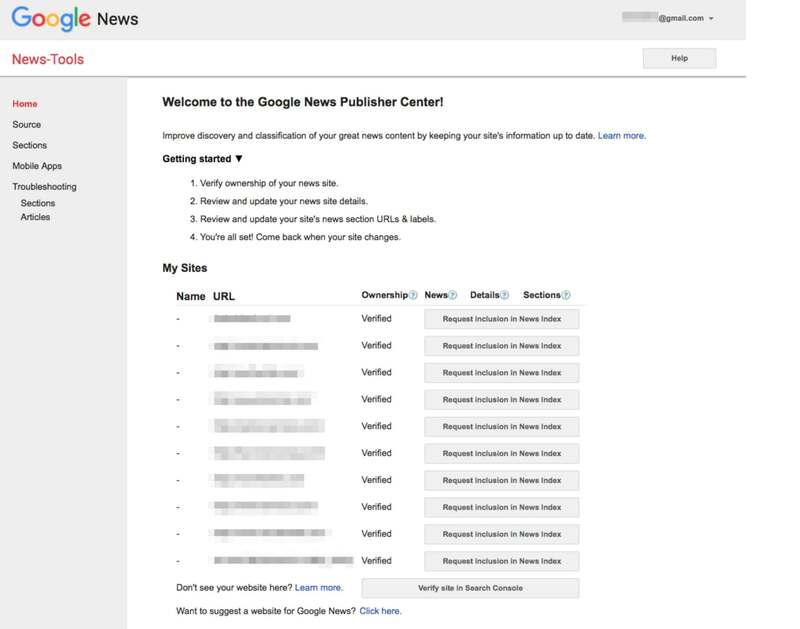 Submit your website for inclusion to Google News Publisher Center. While it’s not a guaranteed method of getting featured in Google News, adding your site to News Publisher is a necessary step. Go to https://news.google.com/publisher to view a list of the sites for which you have verified ownership. Fill out all the requested information, and click “Submit” at the bottom when you’re finished. It takes 1-3 weeks for your site to be reviewed for inclusion. Check the publisher center to check the status of your site. You’ll know you’re approved if your site request has “Included” in the status column. Once you’ve established a toehold in Google News index, it’s time to start publishing high-value news content. 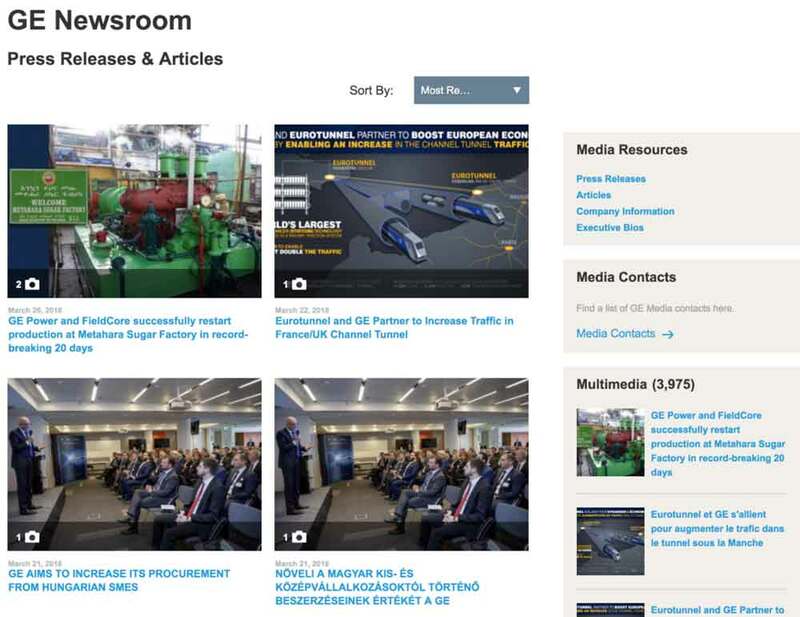 Companies like GE do this using a different website and URL (e.g., https://www.genewsroom.com/) and publishing a variety of content on topics related to GE’s products. The news pieces you publish should not be about your CEO and his or her reputation management. The intent here is to diffuse the focus of the indexation on negative news, inputting instead neutral or positive news. Press releases are not the silver bullet for top-ranked Google results. However, press releases can be a powerful antidote to defamatory news stories regarding your CEO and/or your company. When you publish a press release on a PR website, the service syndicates the news to a wide array of online news sources. There is no question as to if your press release will be syndicated. Even banal bits of news receive tens of thousands of impressions from news aggregators. The press release results displayed below was a brief announcement (“We started a blog!”) from a small manufacturing company. It received more than 140,000 headline impressions. If you publish a press release that features something significant, important, or headline-worthy, the release will get picked up by journalists, news sites, and other major distribution channels. The real power of a press release is in the amount of direct engagement you get — email interactions, phone calls, requests for interviews, etc. Basically, it’s a numbers game. You can suppress the negative search results — Google News or organic. You can bury negative news, no matter how toxic or relentless. Admittedly, the process can be complex and overwhelming, which is why reputation repair companies exist. But this is a task that any CMO or senior executive can perform on behalf of their CEO and company.